"Lovey, vocal and a great ditch digger. He spends his time roaming around free when I'm home." "Luna has been the best dog I could ask for. She loves to be in the mountains and is always ready for an adventure. The lab side of her made her easy to train and she is very well behaved but the husky side of her keeps her curious and always ready to chase a squirrel. Thanks again Matthew for such a good friend!" "Tank is my awesome little orange powerhouse (center). He loves to fetch his ball, and run his little heart out on my recreational team." "We have enjoyed Happy so much...he fit right into our family when he came and is loved by all of us (including the pack)!!! He is an awesome dog and loves to be loved.... 'Happy' sure fit perfect for his name!" "Fire (R) has been living in Oklahoma since April 2014. She was definitely out of her element until we adopted a baby husky from the animal shelter. His name is Failor (L) and he has taught her how to be a pet dog, while she has taught him the ways of the world. She has really become a big, loving part of our family. She is holding down the fort while I am teaching in St. Paul, Alaska." "In April 2014 we surprised the kids with a trip north to pick up Smiley. 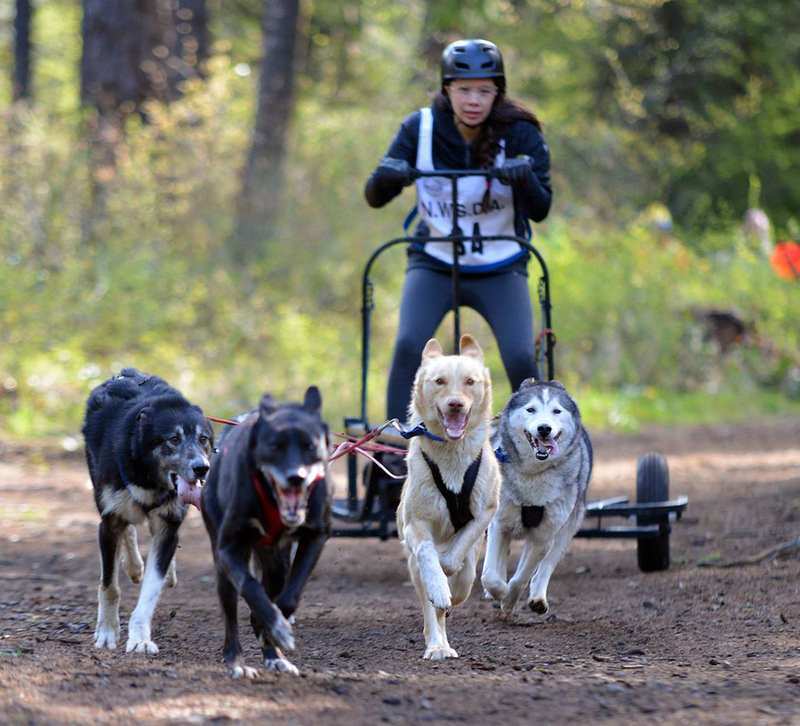 She went from being a multi-Iditarod athlete to sharing a twin bed with Brooke every night. We couldn't have asked for a better match and we love her so much!" If one doesn't think of the next prank the other one will. Summer is being spent down in the slough splashing and digging. They have to have a watchful eye on them when loose...the hooligans :)"
"Juneau (pictured R) loves to run run run. Beautifully athletic. Also likes to get in trouble bossing the smaller dogs. She's the smartest of our other 5 dogs put together! We forget she's a dog sometimes." "TwoFace is thoroughly enjoying retirement - she loves her bed, my bed and her brother Duke Raul's bed. She's a very affectionate, super smart and absolutely stunning girl." Angel is enjoying his retirement in style. He and Sandy (yellow Lab), travel back and forth between Ohio and Alaska with Matthew's parents, enjoying what the two most beautiful (matter of opinion, of course!) states in the Union have to offer. "Otter is loving retirement here along with other dogs from his puppy run to Nome. Unfortunately, he was caught in a trap on one of our free walks and lost a leg, but don’t tell him that. He doesn’t know he ever had a fourth leg. He’s the happiest guy and brings more joy to our home than I can express." Adopted an athlete from us? Send us an update and picture and we'll add you! Thank you everyone for your interest in and support of 17th-Dog / Team Matthew Failor!